Two German-Italian men are bringing a popular German street food to Santa Barbara. Marcello Bisignani and Marco Coccia have opened Urkeb at 413 State St., and the restaurant specializes in serving the Doner Kebap, a dish that comes with either lamb or chicken, along with a variety of fillings, including lettuce, onions, tomatoes and cucumbers, all inside either a falafel-like bread or tortilla. For those doing the low-carb diet, you can also get it all inside a bowl. The two opened the restaurant on Monday. “We think the Doner Kebap is one of the non-exploited universal tastes like the pizza or the hamburger,” said Coccia, who was born in Italy, but raised in Germany. He was a childhood buddy of Bisignani, and gave up his job as an engineer to go into the restaurant business with his friend, who owned and ran restaurants in Germany. “I found myself spending too much time behind a computer putting together Excel and Powerpoints,” Coccia said. Some of the walls in the restaurant are painted green, along with the menu. The color symbolizes the “freshness” of the food. Part of the appeal of the restaurant is its simplicity. Two towers of chicken and lamb spin behind the counter. Customers choose the wrap or the bread, and then choose the filling. The Doner Kebap originated in Turkey, was popularized in Germany. Every dish is $9, and comes with five different sauces: Yogurt house, avocado ranch, smoked onion, parsley vinaigrette and hot habanero. “This is something super new in Santa Barbara,” Bisignani said. They also serve $2 French fries and $2.50 sweet potato fries. 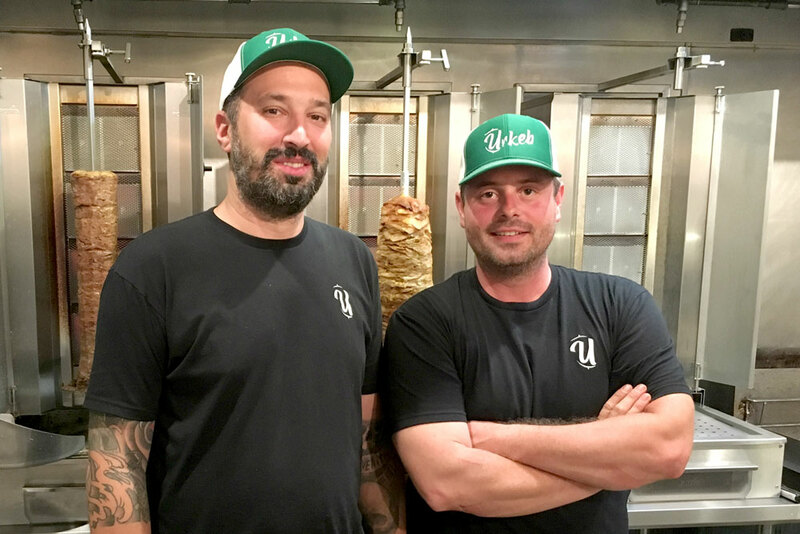 The duo said they got the idea to bring the Doner Kebap to America and approached German investors with the idea. They sold them on the idea and then the friends explored California for places to open. They looked at San Diego, Los Angeles, Orange County and Santa Barbara, Goleta and Isla Vista. They settled on Santa Barbara because of its “foodie” culture and diversity of potential patrons. They want to keep the menu simple so they can focus on quality. “I like when the people try our food and say, ‘Wow, that's awesome,'” Bisignani said. The co-owners have eight employees and are open from 11 a.m. to 10 p.m.; they plan to stay open until 2 a.m. once UCSB starts again. For the entrepreneurs, it is just the beginning. “We didn’t come here for one restaurant,” said Coccia said. “We want to bring the Doner Kenap to the U.S.
Noozhawk staff writer Joshua Molina can be reached at jmolina@noozhawk.com .